My job as a scientist and educator has been very rewarding. I love to share my enthusiasm, experiences, and joys of a career in science and teachign. For fun I listen to music, dance, hike, canoe, water ski, cycle, and enjoy being around people, especially family and friends. My day job is in the USF College of Marine Science as an Instructor and Coordinator of Education & Outreach programs. In layman’s terms, phytoplankton are microscopic floating plants. While there are several different kinds of phytoplankton, the most common ones are the groups called diatoms and dinoflagellates. These organisms are extremely beneficial to the environment in many ways. To the marine ecosystem, they represent food. As the phytoplankton process the sun’s energy into chemical energy (photosynthesis), they are rapidly eaten by larger zooplankton (microscopic floating animals), which in turn are eaten by small fish and invertebrates. As they food chain continues, a large number of organisms are supported through the energy produced initially by the phytoplankton. Unbeknownst to many, humans are extremely dependent upon phytoplankton. Why? Let’s go back to biology class where you hopefully learned about the cycles of photosynthesis and cellular respiration. Photosynthesis, usually performed by chlorophyll containing plants, represents the conversion of the sun’s energy into a storable form of energy known as ATP. (By the way, those chlorophyll containing plants are also found on your dinner plate next to the meat and macaroni and cheese!) Cellular respiration, performed by most life forms, is the complimentary chemical cycle that converts that ATP into form of energy that your body can use – glucose. So, what does that have to do with humans besides the much needed ATP? Do me a favor…take a deep breath in…and now exhale. (Repeat as necessary!) The oxygen you breathe in day after day is a byproduct of photosynthesis. Plants, including the enormously abundant phytoplankton in the oceans, provide the essential compound needed for you, as well as most life forms on earth, to survive. In fact, most scientists agree that these single-celled organisms were the major force in converting earth’s early toxic atmosphere into the life-supporting blanket it is today. So, when you wake up each morning, do me a favor, please give a big shout-out to the diatoms and dinoflagellates of the world! Without them, you and I would be breathing a bit heavier each day. Starting July 9th, FWRI’s Fish and Wildlife hotline received reports of fish kills, mostly of benthic reef fish (e.g. goliath, gag, and red grouper, snapper, hogfish, grunt, triggerfish, etc.) 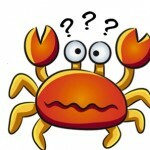 and crabs. They also had reports of discolored water. These reports are continuing. On July 23rd, law enforcement officials along with Fish & Wildlife Health staff sampled water quality approximately 40 miles west of Hernando County. 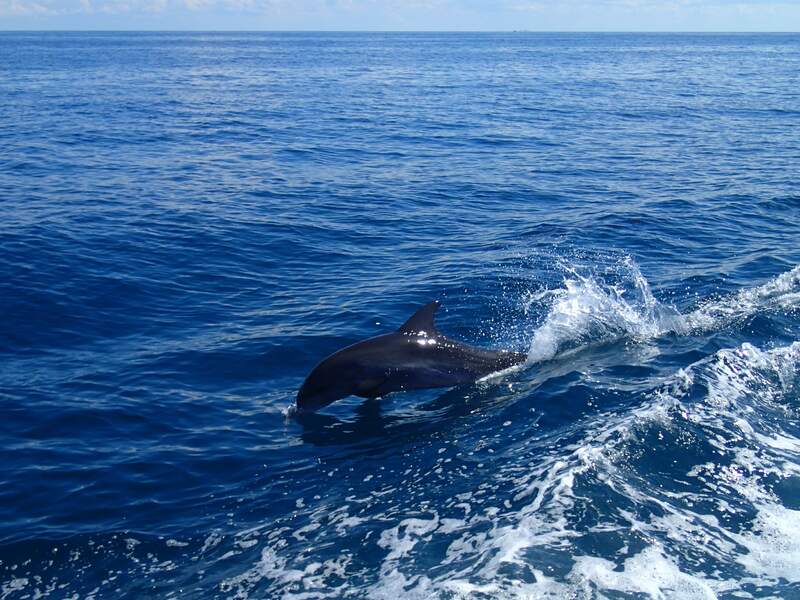 A surface bloom patch was detected approximately 80 miles long and up to 50 miles wide, 40 to 90 miles offshore between Dixie and Pasco counties. A presence of Karenia brevis was confirmed in surface water and at depth. Through continuous satellite imagery and water sampling, bloom concentrations are being monitored. 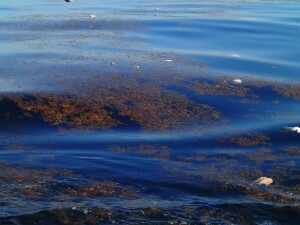 Blooms of the Florida red tide are naturally occurring. 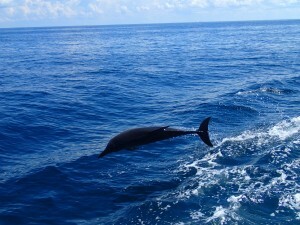 They develop off shore in the Gulf of Mexico during the late summer and early fall. Physical conditions in the gulf are keeping the surface bloom offshore at present. The extent of its intensity and size of the current bloom is notable. Stronger than normal circulation in the northeast Gulf of Mexico is likely the cause of the bloom spread along the surface. Historically, the last extensive offshore and benthic community die-off due to red tide occurred during 2005. The last extensive red tide was in 2012 and 2013, when a bloom persisted in southwest Florida between October and April. YOU CAN HELP AND STAY CONNECTED! • Check status reports at MyFWC.com/RedTide for information and interactive Google Earth maps. • Call 866-300-9399 for a recording. • Report observations of fish kills to the hotline at 800-636-0511. Injured or dead sea turtles or manatees should be reported to 888-404-3922. • For public health related inquiries, contact the Florida Department of Health. I would like to thank Sue Murasko with FWRI for providing this invaluable information. WOW! The ship has been a buzz with activity. From water collection to remote imaging to meal preparation to mechanical troubleshooting, everyone on board has quickly settled into their roles and are efficiently operating this well-oiled machine of a research cruise. Many times during the scientific process, a scientist will be presented with an opportunity to change their original plan and adapt to accommodate this change. This happened while on our cruise with the presence of an earlier than usual red tide in the northeastern Gulf of Mexico (offshore of Hernando county, FL). Florida Fish and Wildlife Research Institute (FWRI) jumped on the chance to sample this red tide in addition to the predetermined sample sites of the original cruise plan. Sue Murasko (FWRI) was leading the charge of these sampling sites. With only three additional sampling sites, she wanted to make sure that we were accessing water sites located within the bloom. Heather Broadbent (chief scientist) and Sue spent the first few hours of the cruise determining the latitude/longitude of these 3 red tide sampling opportunities; the final locations were set in the middle grounds of the gulf which were en route to the original cruise sites. 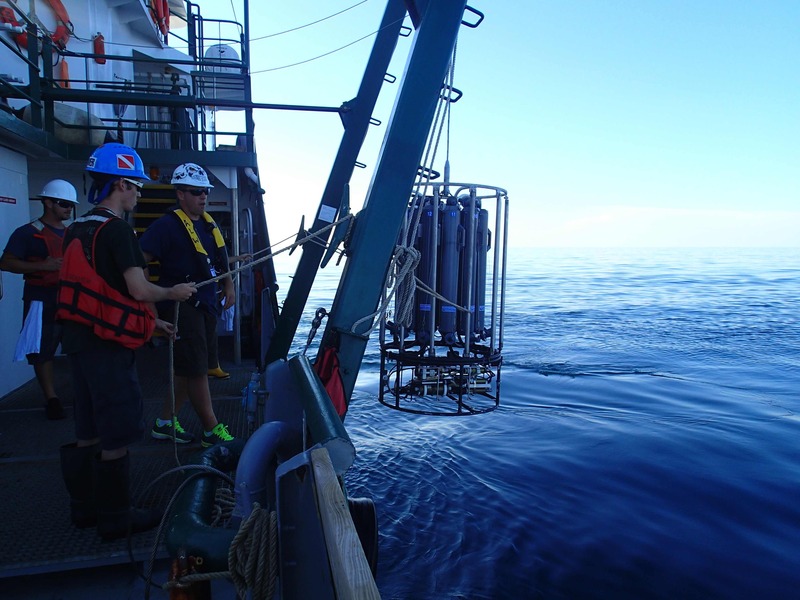 CTD water samples were taken during the 1st and 3rd sites while oxygen readings were taken at the 2nd site. 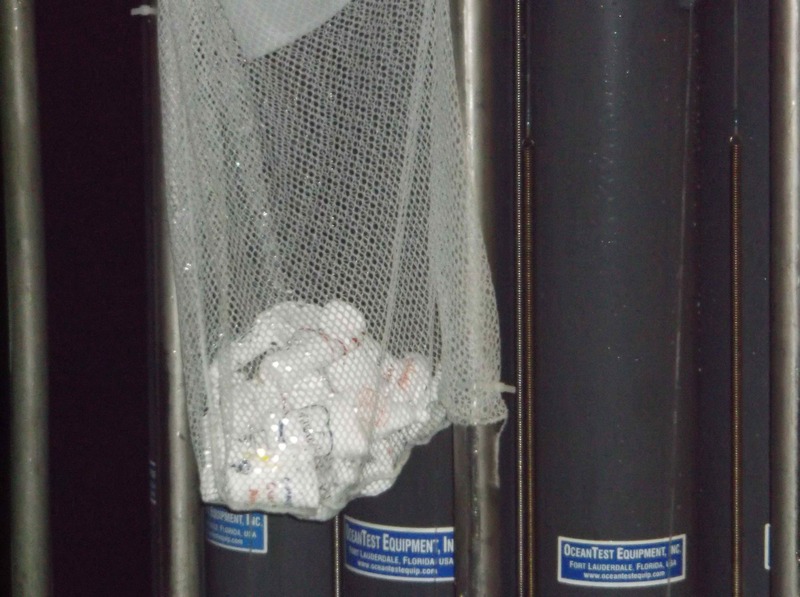 The CTD water samples will give an incredible amount of information not only regarding water quality but also many organic and inorganic measurements of the red tide. 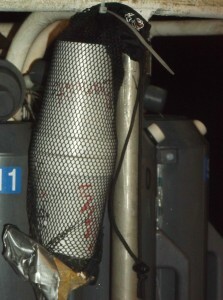 The oxygen readings were taken in order to determine if an anoxic event is present. While the sampling and measurements were taken on board, all of the analysis will take place in the laboratories back on shore. The CTD rosette consists of 12 cylinders which are able to capture water samples at different depths in the water column. I was awarded an interesting job for the evening – the official “dead fish spotter”. One of the effects of red tide is a fish kill. Red tide is a very specific type of algal bloom known as a harmful algal bloom (HAB). An algal bloom, very simply, is a large explosion, or bloom, in the population of a phytoplankton. Red tide is caused by a particular species of phytoplankton; a dinoflagellate known as Karenia brevis. 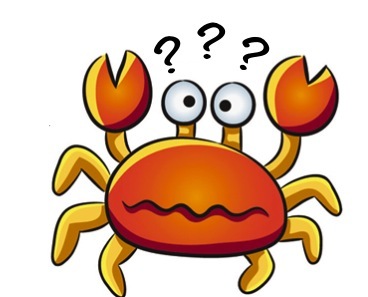 K. brevis contains a neurotoxin; a chemical that essentially paralyzes fish which prevent them from swimming. A fish kill describes a large number of fish that have died due to a traumatic event. So, a common and easily spotted indicator of a red tide bloom is the presence of dead fish. Sue asked that I be on the lookout for areas with floating dead fish with the hopes that our sampling sites corresponded with the bloom location. I eagerly obliged as it meant that I could watch the sunset over the gulf while on guard for floating fish! 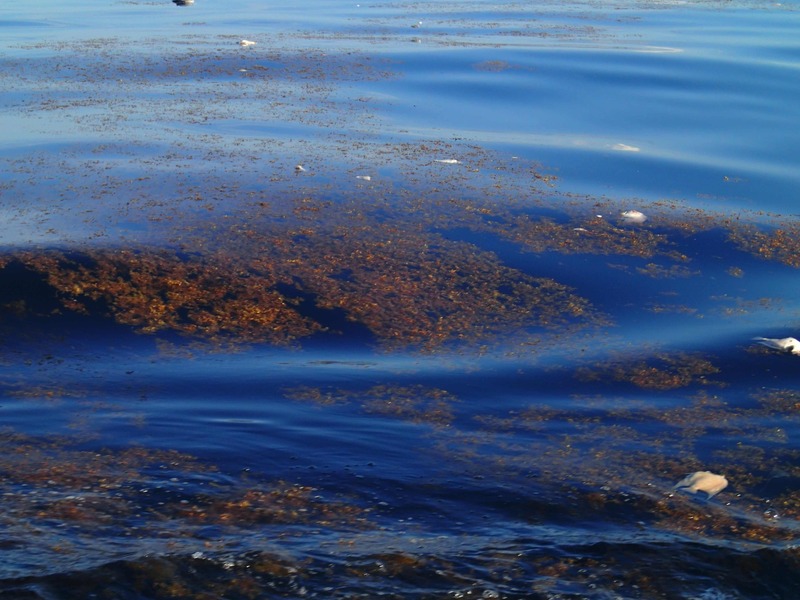 The floating Sargasso seaweed wasn't the worry; we were concerned with the floating fish which were probably a result of the increased levels of red tide in the water. Overall, it was interesting to be a part of the impromptu task of additional sampling. 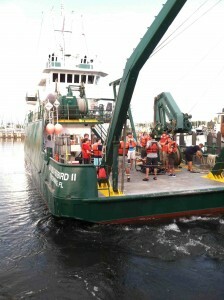 In a testament to the scientific process, Heather and Sue worked together to accommodate both the original cruise plan as well as the red tide sampling. Science rules! We had some visitors while on route to our first sampling site. A pod of 6 porpoises joined us for a small period of time. They were playing in the boat’s wake; jumping over the waves as well as each other. 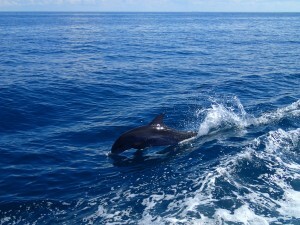 I don’t think there will be a time when seeing dolphins or porpoises out in the wild will ever get old. I am always in awe! 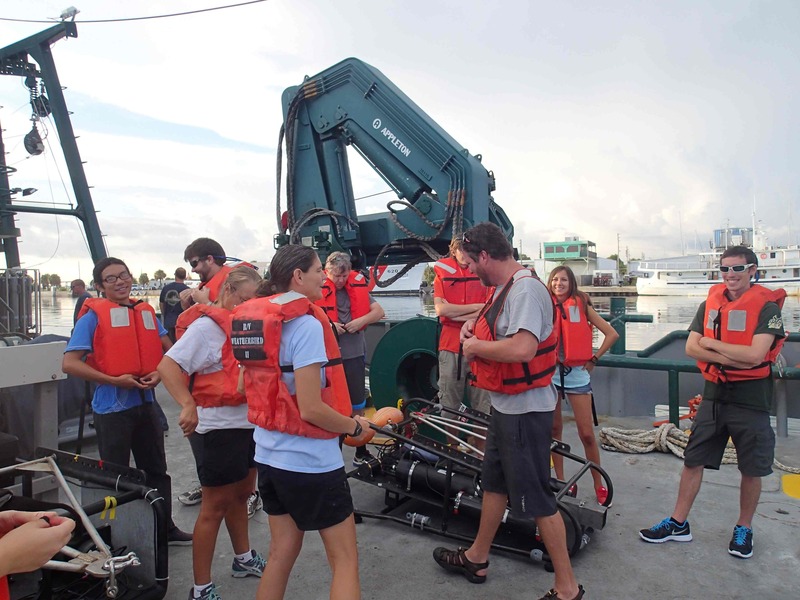 The goal of this cruise is to investigate the impact of the BP oil spill on the northern Gulf of Mexico ecosystem, focusing on the lower end of the water column food web. Researchers from the College of Marine Science (USF) and RSMAS/University of Miami will assess the impact of oil on Florida marine ecosystems by comparing non-impacted west Florida shelf and impacted north Florida shelf sites. Hmmm, what to do on a boat for 7 days? So, now that I am going, what am I supposed to do? 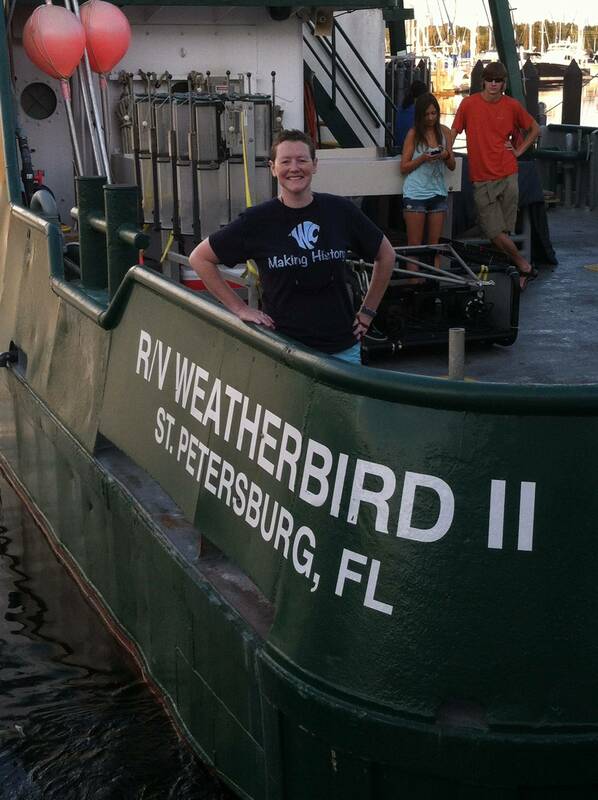 The R/V Weatherbird II will set sail in 2 days and I am beginning my preparations for the research cruise. I feel that I am in a unique position as a teacher with a science background. I graduated from the University of South Carolina with a BS in marine science and from the University of Maine with a MS in marine biology. Teaching is my second career but I have always been confident in my knowledge and teaching abilities. With this opportunity, I am hoping to develop lesson plans to use in the classroom that introduce students to science with real time data and applications. So many times, I have found myself adapting an activity that I have found so that my students can understand the objectives. Unfortunately, the number of marine science related activities available to teachers are extremely limited and those that are available are often too simple for high school or too in-depth and involved for an average class length. So, my goal is to begin to develop lesson plans that will be relevant and attainable by all. I have taught marine science for 10 years and pretty much know the curriculum inside and out so I can begin to mentally think about what units are lacking in hands-on activities or manipulatives. I am excited about the possibilities as I begin to plan experiments; the first being about pressure. It is hard for students to understand the dramatic increase in pressure with depth. So, I would like to demonstrate this using Styrofoam. 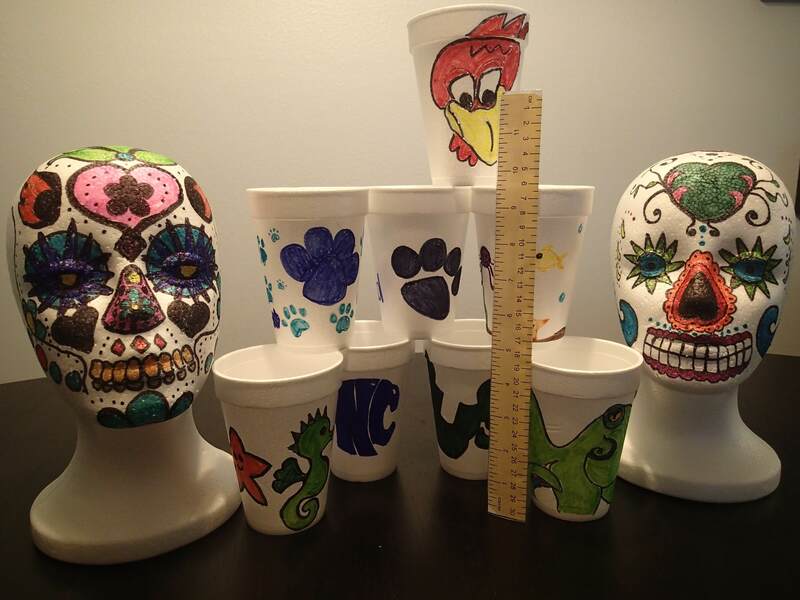 I have decorated several cups and 2 heads that will lowered towards the ocean floor during the cruise. I am very excited about the results! Let me share the BEFORE photos and be on the look out for the AFTER photos! 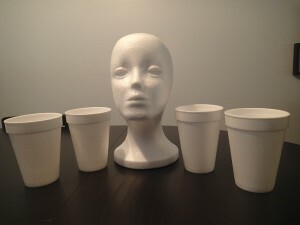 A sample of the Styrofoam heads and cups that will be lowered to the ocean floor. I had to decorate them, right? A 12-inch ruler has been included for size relation. 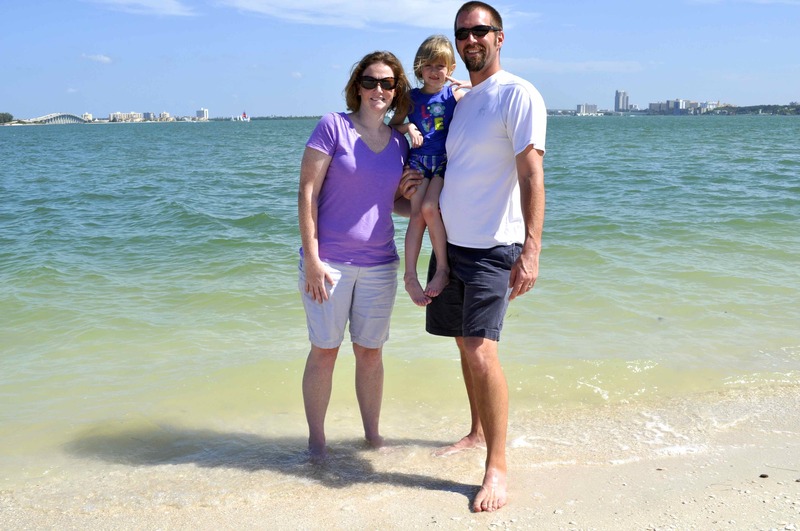 Newest teacher at sea, Susan Cullum, spends as many days as possible at the beach with her family. Meet the newest Teacher at Sea! Hello! I would like to introduce myself. My name is Susan Cullum and I will be the teacher at sea for the next research cruise out into the Gulf of Mexico. The Deepwater Horizon blowout was such a significant environmental event and I am incredibly honored to be a part of the scientific crew which has been given the task of studying the impact of the oil to the ecosystem. I have been teaching science at Wesley Chapel High School for 10 years which is located in Pasco County, Florida. I primarily teach Marine Science to upperclassmen but I have also taught Biology and Physical Science. Because I have a background in the field of marine science, I also teach a Dual Enrollment course in which students receive science credit from the high school as well as college credit from Pasco Hernando State College. I graduated from the University of South Carolina with a bachelor’s degree in marine science and from the University of Maine with a master’s degree in marine biology. I find myself lucky to be teaching students the subject that I am incredibly passionate about and which I have focused my world around. My husband, Brian, and I have been happily married for 11 years and we have a 5 ½ year old daughter, Peyton. She is a bright and energetic little girl who is fascinated with all kinds of living creatures. In a small way, I hope that what I am participating in with this research cruise may have a positive impact on the world in which she will grow up. I hope that you will follow along with me as I chronicle the scientific research aboard the R/V Weatherbird II during this upcoming cruise as well as behind-the scenes details of life at sea. 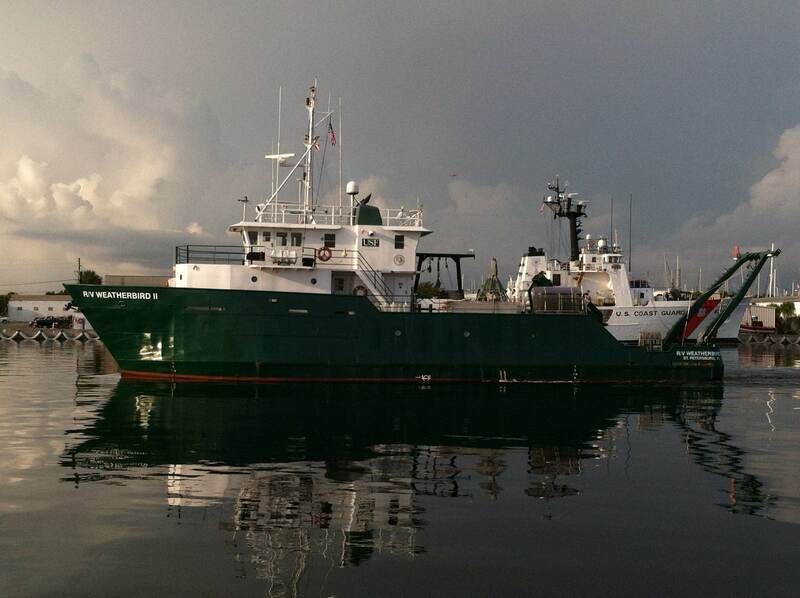 Posted by K. Bylsma, Teacher at Sea, C-IMAGE , August 8, 2013. The original styrofoam cups came back up from 2300 meters at DSH09. Then, we sent styrofoam cups to 1450 meters at DWH. How does the depth affect the styrofoam? Maybe it’s the water chemistry that is different and causing this effect. Maybe we sabotaged the cups, ourselves ??? What do you know about water pressure? If you scuba dive, then you know a great deal. What do we truly understand about barometric pressure ? I located a couple of exercises for students to explore these concepts at the NOAA and USGS sites. 1.Define the depth for which you wish to calculate the pressure. Determine whether the water is salt water or is it fresh water. 2. Multiply the depth in feet by 0.432 to calculate the underwater pressure in fresh water, in pounds per square inch (psi). If the depth of fresh water is 100 feet, then: 0.432 x 100 = 43.2 pounds per square inch. 3. Multiply the depth in feet by 0.445 to calculate the underwater pressure in salt water, in pounds per square inch. If the depth of fresh water is 100 feet, then: 0.445 x 100 = 44.5 pounds per square inch.